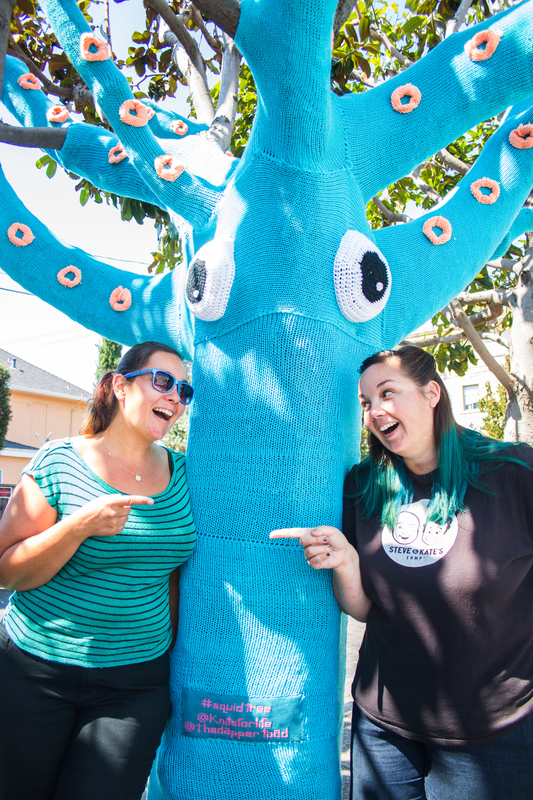 Introducing #squidtree, the latest transformative yarnbomb from @TheDapperToad and @KnitsForLife. Time and again the story goes: we love our idea, then halfway through we fear it’s going to be crap, but end up falling in love all over again when the result exceeds our expectations. People on the street frequently asked how we conceptualized, measured, made the panels, and put it all together. For the benefit of all yarnbombers planning an installation, I’ll go into a little detail and include some tips. You can get tons of specific advice like this in ishknits’ Yarnbombing class, which I’m taking on Skillshare, and which you can take too (use this link to get a amazing deal). 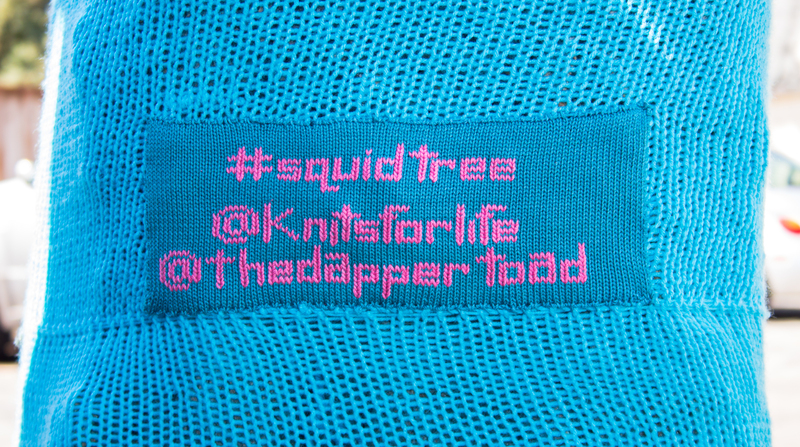 You can find more of Jill’s amazing photography of the #squidtree over at www.dappertoad.com. Two of my aims as Artist in Residence for Downtown San Mateo are to beautify the area and to bring the community together around art. It’s easy to transform an object for a nice, busy street. It’s harder to transform not only an object but a downtrodden area. I hoped to turn a corner full of drunk idlers and urinators into one where families and children can linger and play, hopefully forcing the idlers to find a different corner. It worked! The buzz around the corner has definitely changed: now people stop their cars and strollers to take photos (instead of speeding up to avoid it). 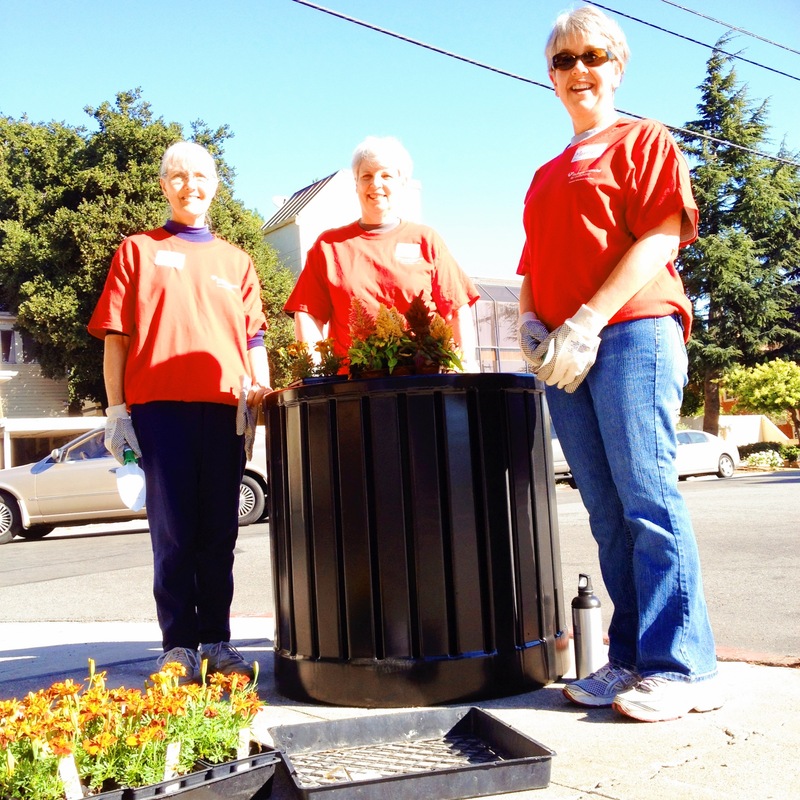 We were honestly surprised by how many people thanked us for improving the neighborhood while we worked. Even grumpy old men were sold on our unusual medium, asking when we plan to do more. My Yarnbombing class encouraged me to time my yarnbomb installations with events. 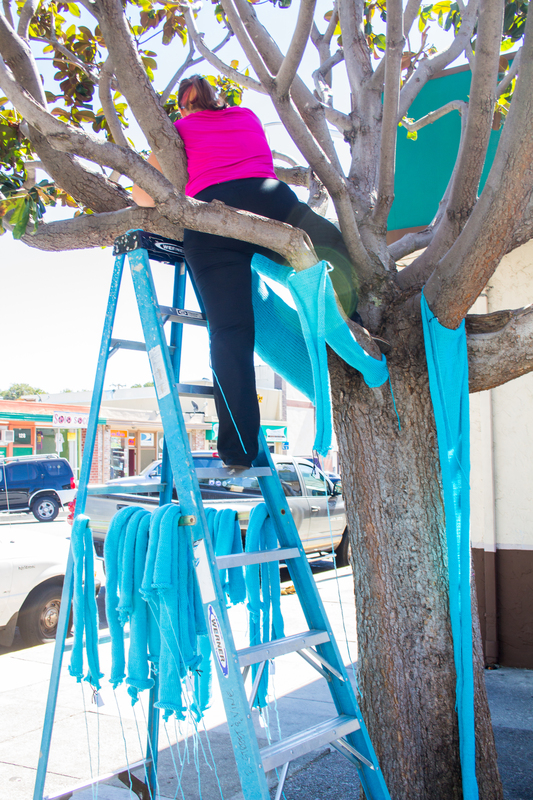 Fortuitously, the Downtown San Mateo Association needed a yarnbomb installation for a volunteer clean up on North B Street. No brainer! Of course I teamed up with Jill to attempt to top our work for the previous downtown clean up. Sizing the tree was easy to simplify. Each branch is 1-3 rectangular sections and the trunk is 3. For each branch, we measured its circumference near the trunk with a soft measuring tape, then extended a a metal measuring tape to a length where the branch got considerably smaller. We repeated this for a good length of each branch, using estimates for the hard-to-reach parts. Only 2 extra small squares among the branches and trunk remained. We chose Red Heart Super Saver Yarn in Turqua and Caron One Pound in Peach for their color, durability, and value. Instead of carefully swatching and calculating the amount of yarn needed, we dove right in at Joann Fabrics since everything was on sale for one more day. We cleaned out my local store and left another store with just 5 skeins! Pro tip: www.joann.com has a local inventory search feature! 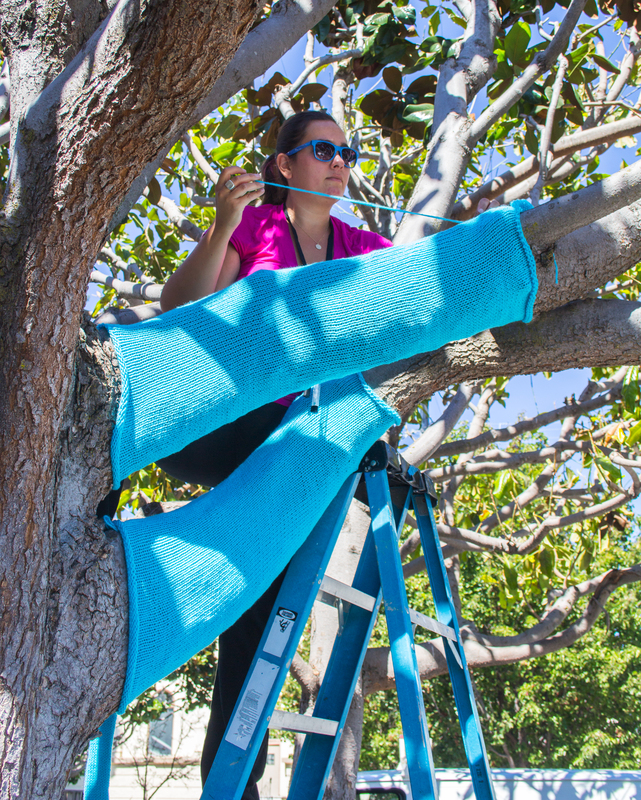 After knitting a swatch, we calculated one trunk panel, then tried it on the tree to double check and get the stretched gauge. We used the stretched gauge for the stitch and row count on the remaining panels. This is a pretty important point so that it doesn’t sag too much over time. Jill and I blew through all the panels in just 2 days! Knowing she’d force me to be up on that ladder most of the time, I “let” her manhandle the Bond most of the time. The entire project used 4 miles of yarn, about 90% of which Jill churned out on “James”. 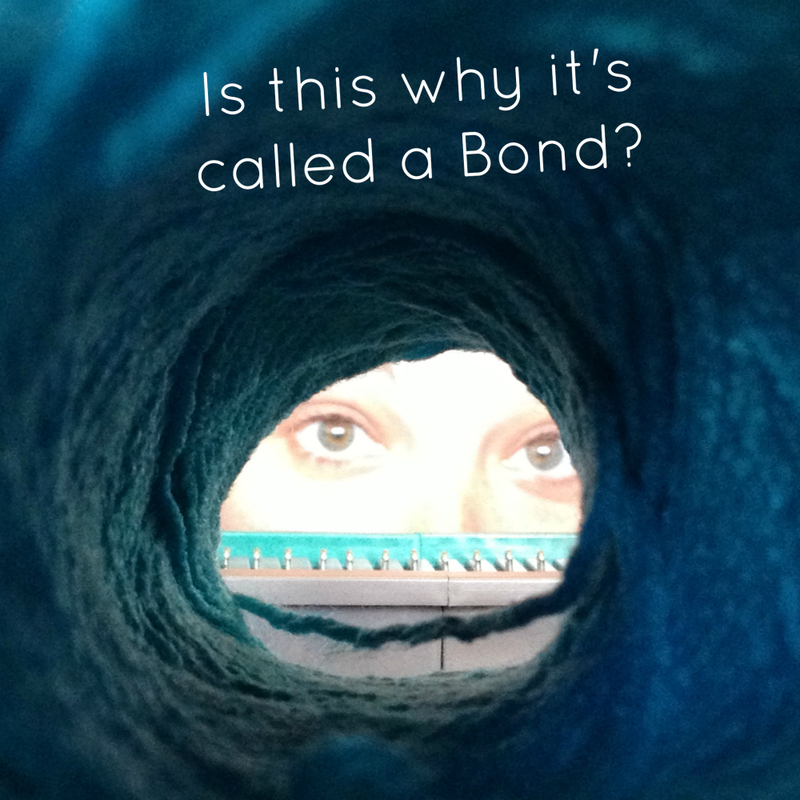 Is this why they call it the #Bond ultimate sweater machine? 28 man-hours and two bouts of heat exhaustion later, we sewed every last bit together. People often ask how we sew it together. It really doesn’t matter: whatever’s fast and secure. Sew together as much as you can before hand. Stapling large panels to the tree helps prevent sagging over time. Pro tip: avoid wasting time by assembling your most essential tools on your person. 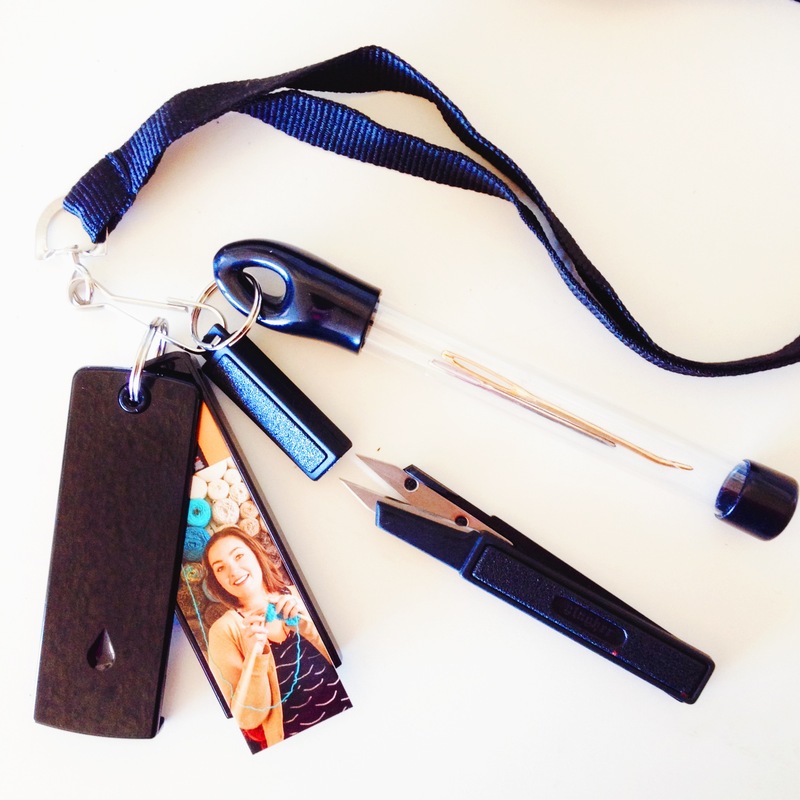 I use a lanyard with thread shears (Amazon.com), a needle case (an old bead tube), and my Moo cards for conversations. It saved me climbing up and down the ladder and losing things in my pockets. In Jill’s experience, the best way to make a project come alive is with eyes. 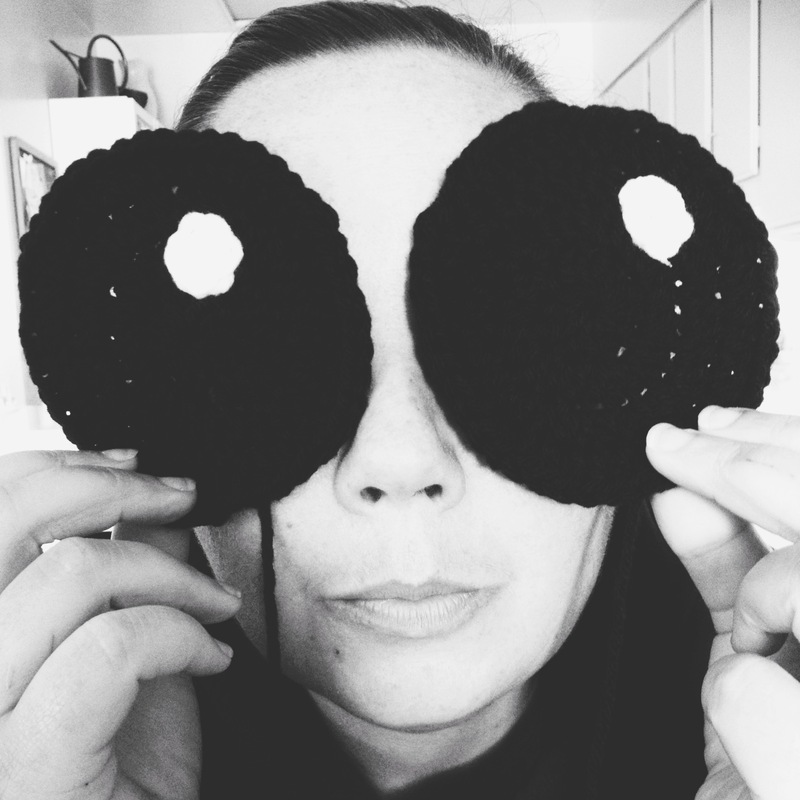 We crocheted the big eyes, adding details like catch lights and lots of bulbous stuffing. 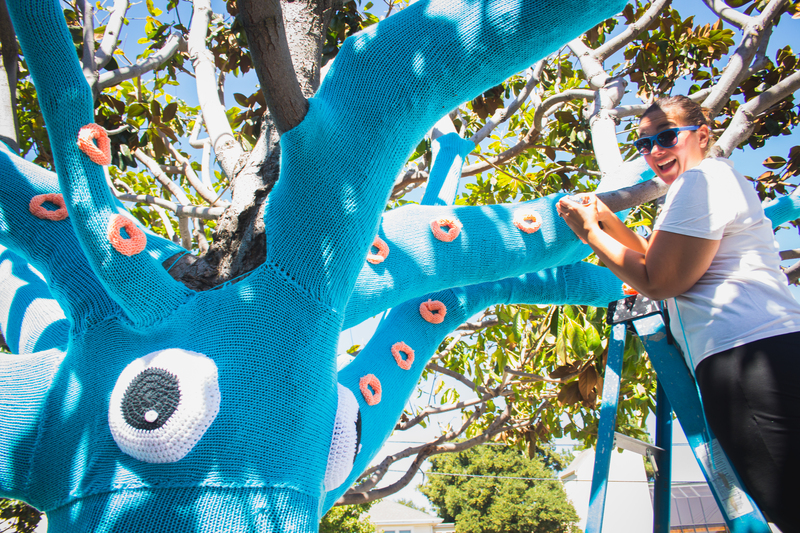 Almost done with our epic #yarnbomb in @downtownsanmateo. Stay tuned! 3-D suckers made a huge impact, too. Jill machine knit an entire skein of one-pound yarn into a 30-foot piece to cut into strips (she ran it through the sewing machine around each cut site so it wouldn’t unravel). Bam, 75 suckers, in no time flat, baby! They rolled right up into cute rings that we staple gunned right onto the branch. 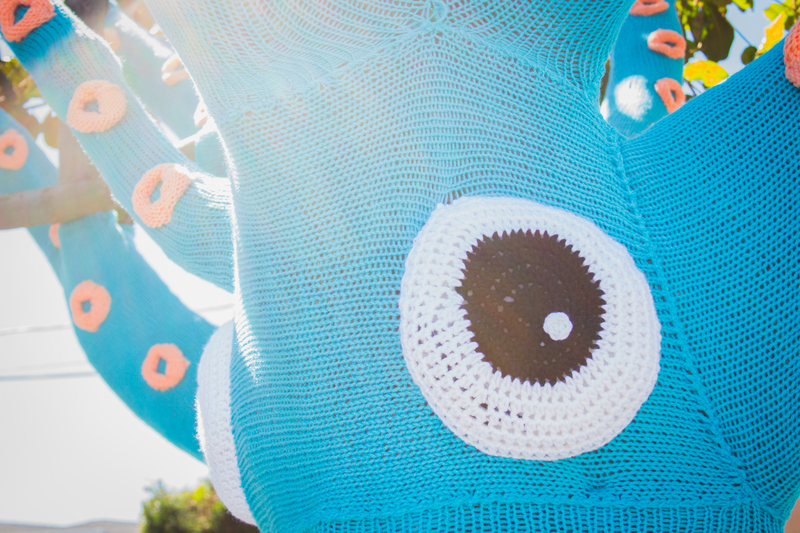 To add a little realism, we put two crochet goldfish in the tentacles so as not to leave our poor squid hungry. Here’s the pattern for these beautiful fish. 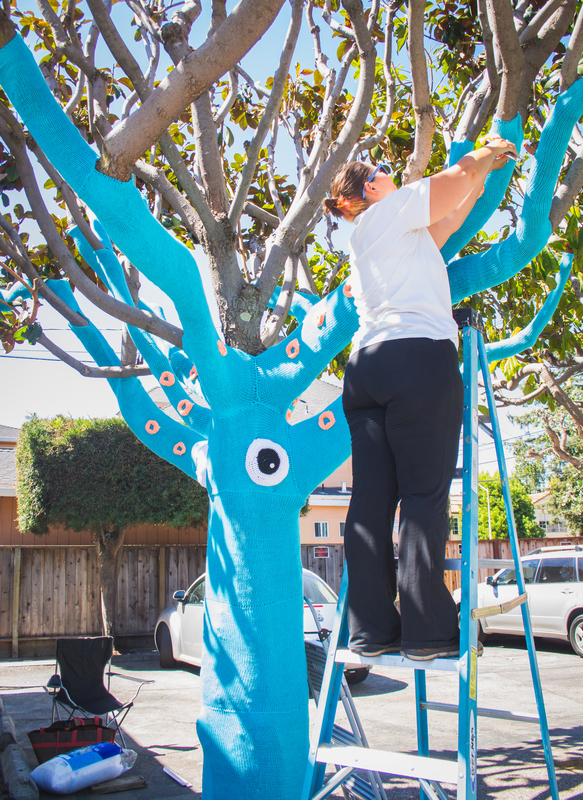 We learned from the city arborist that this magnolia was pruned incorrectly, exposing the bark to sun damage, so the squid is actually helping it this magnolia thrive! Next spring I expect to see a whole afro of white blossoms on top. Thanks to everyone who supported us! Downtown San Mateo Association for the opportunity. Thrivent for the yarn. B Street & Vine for the ladder. The property owner for his blessing. José the handyman for the shims. The Los Primos customers for the fresh coconut water. Reblogged this on Understanding Alice. How long does it stay up and does the tree do okay with it? And what if the neighbors aren’t happy having the tree covered with a spashy color??? As the post explains, the owner loved having art on his property and the arborist told us it actually helps this magnolia. 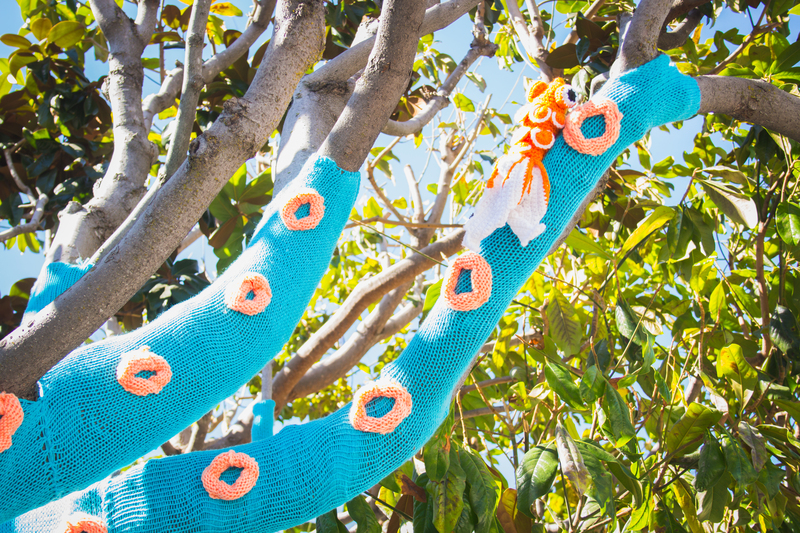 We always maintain out yarnbombs as they age and take them down when they are no longer beautifying. We’ll see how long this one lasts! I love it! I bet it gets people walking and talking through the neighborhood. Bravo! Thanks for the step by step. I’ve never yarnbombed but am a little bit less intimidated seeing just what went in to this one. Glad it helped, Kristina! 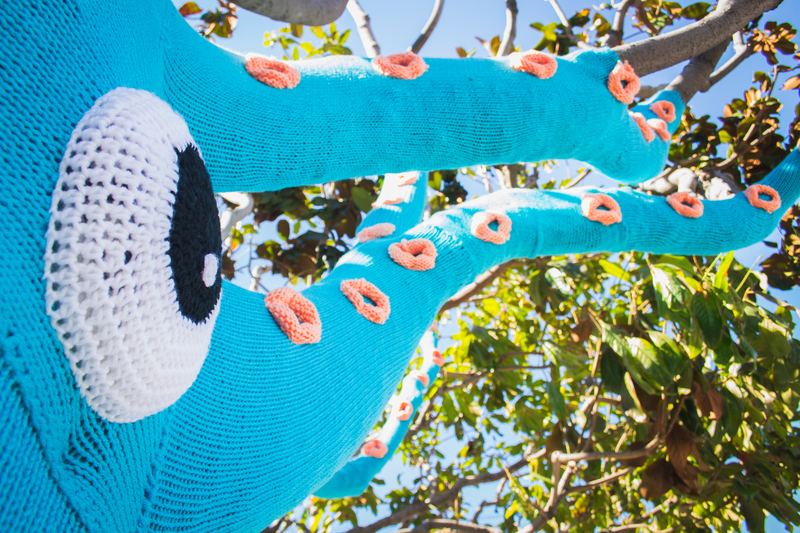 There’s nothing to fear about yarnbombing. 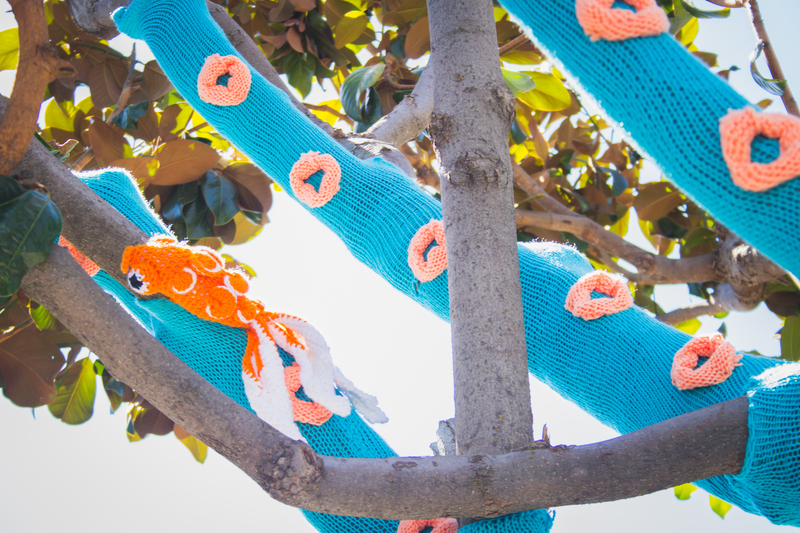 A great way to start is to take the Skillshare Yarnbombing class here: http://skl.sh/17Sqp57. Wow! This is amazing and so beautiful! So love discovering the bombs…..but the squid blew me out of the water when I saw it today. Pure, Joy!!! Thanks, Bruno, this is wonderful! Did you actually see it in person? If you send or tag me in a pic of you with it, you’ll get free Wine Walk and Battledish tickets for Oct 5! Where is this? I want to take my kids to see it. N B St & Tilton in Downtown San Mateo. Tag me in an Instagram pic if you go! My sons and I found it last night (well, I’d seen a photo of it already on the San Mateo Patch news)… so amazing and fun. Thank you! Thank you so much, I’m so happy you got to see it in person! Pupusas all day, right? 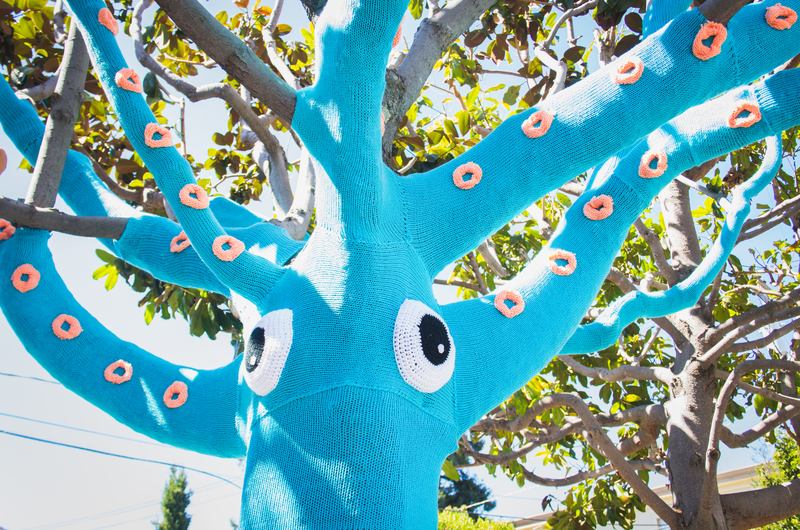 We’re planning more yarnbombing downtown in December, so keep your eyes peeled. That is really amazing work! It makes me really happy to look at this bright and colorful creation. Reblogged this on PRASHANTH SRIRAM"S.
That is so cute – by far the best yarn-bombing photo I’ve ever seen! Funny, I was just thinking about yarn bombing the other day when my Fascist hometown banned signs for start-up home businesses. 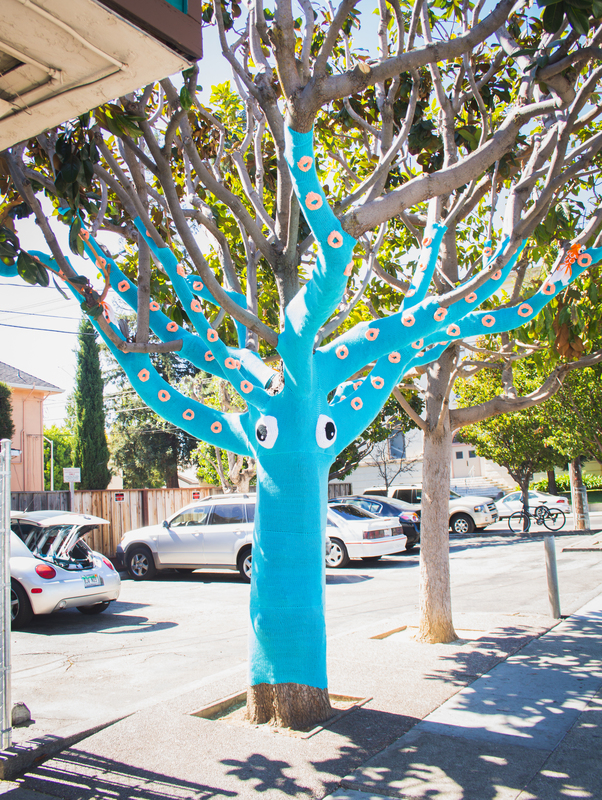 You can’t ban yarn bombing because legally it’s just a tree wrapper! I just love this…well done! Yep, rain doesn’t seem to bother acrylic yarnbombs much. Some stuffed yarnbombs can stretch out a bit and lose their shape after a rain, but this one is fine. It even rained like a week or two after we did it, by some freak chance, and it held up great. I’m glad we don’t get snow! Hey! This is in my neighborhood. I hope it’s still up. I’d love to see it. 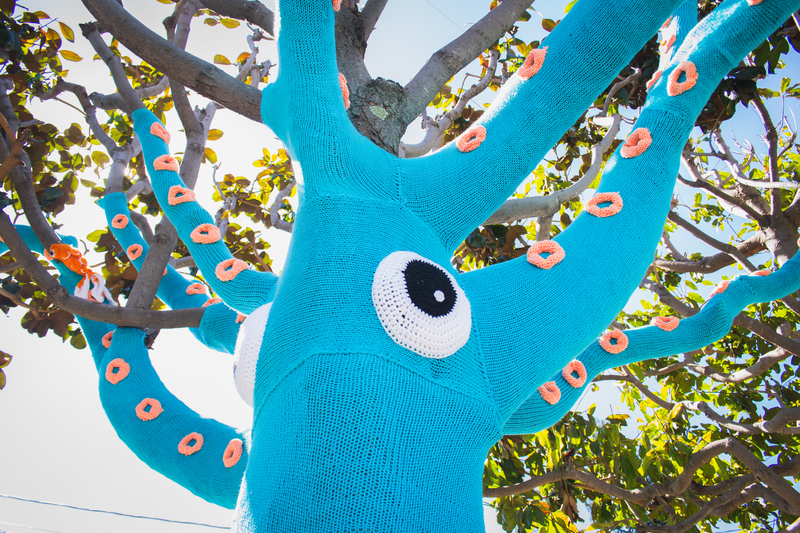 It’s such a clever yarnbomb! Haha – this is wonderful!!! This is great! I have seen some yarnbombing projects but never really thought about how they “worked”, so your step-by-step description of the process was fascinating. Thanks! This is AWESOME! Thanks for sharing the processes. Creative and different. Loved your concept. I’ve seen these around and always wondered how it was done. I like that you created a narrative with it. Most of the ones I see look like socks on trees. I’m a big fan of public art in general though, especially when it can make people stop and smile, or just say wtf. This is brilliant. A great way to transform the area and nurture the tree. Amazing work…no words for your efforts..! That is fantastic! So creative and inspiring! Slightly insane, but in a good way. This made me smile. I LOVE THIS! Great job, wish I could see it in person!! this is the funniest thing I learned about in social media class! Reblogged this on Diving With Sharks. Thanks for posting the “walkthrough” of sorts about this project. I was recently trying to explain the concept of how yarnbombing works to my boyfriend and I know I left him more puzzled than enlightened. The color choice of the yarn is clever and fun– and I adore the little fish attachment! I wonder when I’ll get up a little bit of courage to maybe leave something beautiful like that awesome squid out in the wilderness! Definitely don’t fear! I’m so glad you’re motivated to yarnbomb. 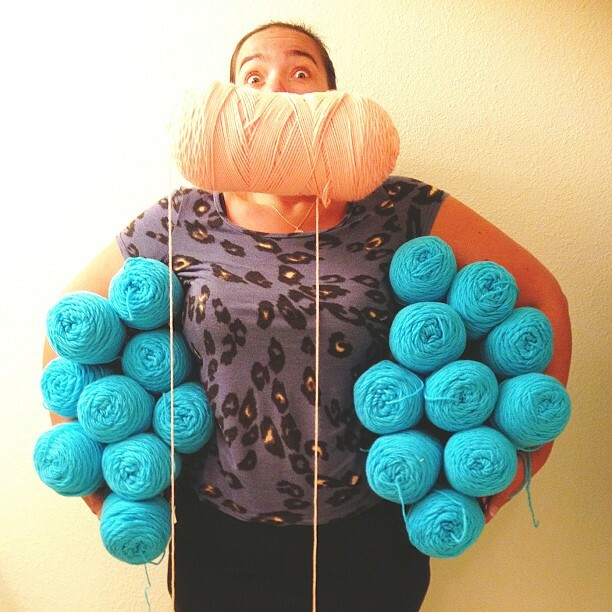 If you take the yarnbomb course mentioned in the post it will definitely muster up the rest of your courage and give you a fun starter project. Have fun and let me know how it goes! Never seen anything like this before! It doesn’t hurt to ask! 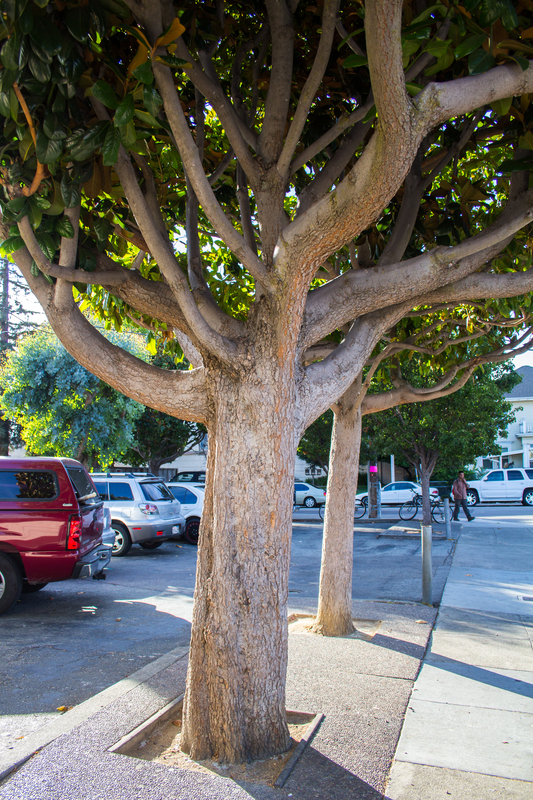 Try asking property owners whose trees you like or talk to your local Public Works department. Reblogged this on Save every Moment. This is so lovely. I really admire your energy and enthusiasm. 1 quid please…sorry 1 squid please. 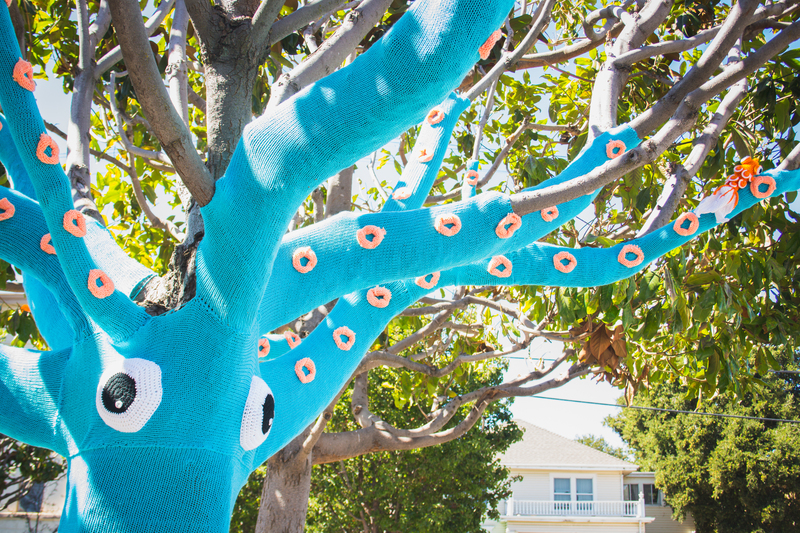 Pingback: Squid tree yarn bomb | TEXO.